Nicky Brett after winning the Scottish International Open last year. Local bowler Nicky Brett begins his defence of the Co-operative Funeralcare Scottish International Open in Perth on Monday afternoon against his young Warboys club-mate Robert Elmore, who has qualified for a World Bowls Tour event for the first time. Brett, the new world number one, is bidding to win the title for an unprecedented third year in a row, having beaten the man he replaced at the top of the tree, Scotland’s Paul Foster, in the last two finals. In fact, the world’s top two are seeking to appear in the final for a remarkable fourth year running, with Foster having beaten Brett in the 2012 decider. Victory for Brett is likely to set up a second round clash with Scotland’s former World indoor champion Stewart Anderson next Wednesday. Meanwhile, Brett was in action for the England men’s indoor team at Stanley over the weekend in the annual Test match against arch rivals Scotland which went right down to the wire before England edged home 6-5 by virtue of Mervyn King defeating record six-time world indoor champion Alex Marshall in the final singles rubber. 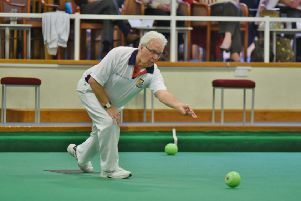 Brett was successful in the triples, but lost in the pairs with Greg Harlow and in the singles to Mike Stepney.